Today, with all its beautiful sunshine, makes the colors that are emerging on the trees even more beautiful. 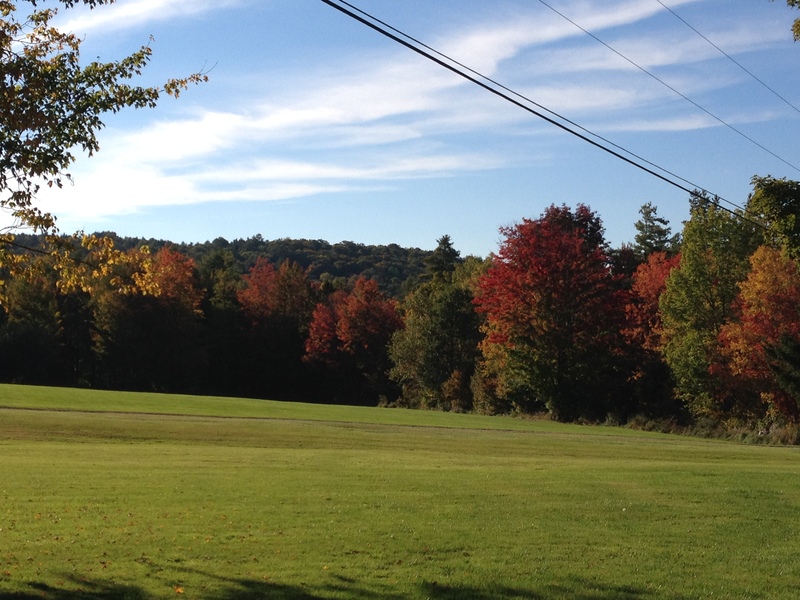 It seems that each day the colored foliage is more and more prevalent. Now, the mountains are clearly dotted with yellows, reds and oranges. Seems that we are starting the foliage season already. According to the news, the state will start its foliage reporting to advise leaf peepers of the changing colors. There isn’t much changing happening our way, although you can definitely notice a much lighter green on the trees and a definite yellow tinge to a lot of them. There are some trees that are already changing, mostly those that are either young or stressed. I thought that it might be fun to post our own foliage report. So, I will post photos of the same view so anyone out there that cares, can watch the leaves in our neck of the woods start the foliage parade through the coming weeks. Here’s today’s photo. As you can see, not much in the way of color going on yet, but it’s definitely coming. 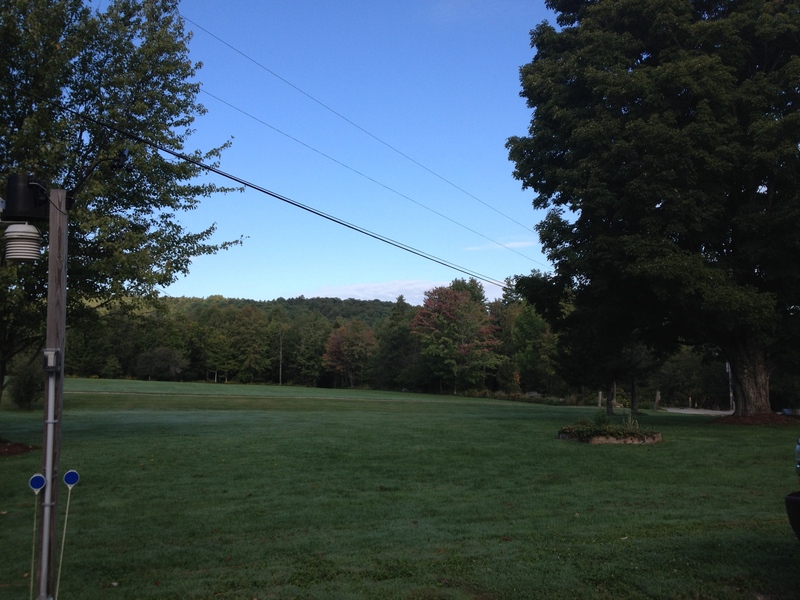 The First Fall Foliage Update of the Season! A little Memorial Day snow? Memorial Day is the traditional “start” of the summer season. Often celebrated by BBQs, picnics and trips to the beach if you live close enough to a beach. The town pool was definitely enjoying its opening weekend. When we moved to Vermont, Memorial Day didn’t have the same “start” of summer feel to it. Perhaps it was because things weren’t as warm here at the end of May. The pools don’t open, but the parks do. This weekend, as I type this it is 41 degrees — hardly summer type weather. The forecast is calling for a high of 48 tomorrow, again not summer weather and then snow tomorrow night. Yes, you read that correctly, SNOW. The forecast for the higher elevations (where we are located) has vacillated between 2 inches, 5 inches and now it’s one inch. In any event, snow just don’t scream “summer”. For those who like skiing or snowboarding however, it might be excellent news, since Killington is still open for such activities. We have had a winter with not that much snow. In fact, I don’t think that we have had anything that you could really call a storm. Nothing that even bears a resemblance to what our relatives in New Jersey and the rest of the mid Atlantic states have had. Too bad since the snow should be up here where it is appreciated. The words “Winter Storm Warning” or for that matter “Winter Storm Watch” have barely appeared on our weather forecasts this winter. Don’t get me wrong, we have snow, it snows a little here, a little there….but no snow storm. No dumping of snow. That however “may” change (I hate to type it for fear that the weather, being as fickle as it is to us New Englanders might change once again). Snow is predicted for every day this week starting tonight. Perhaps, just perhaps, the significant snow that they predict for Tuesday night into Wednesday and then again Thursday night into Friday might be a storm – or two of them if we are lucky. Wouldn’t that be nice? 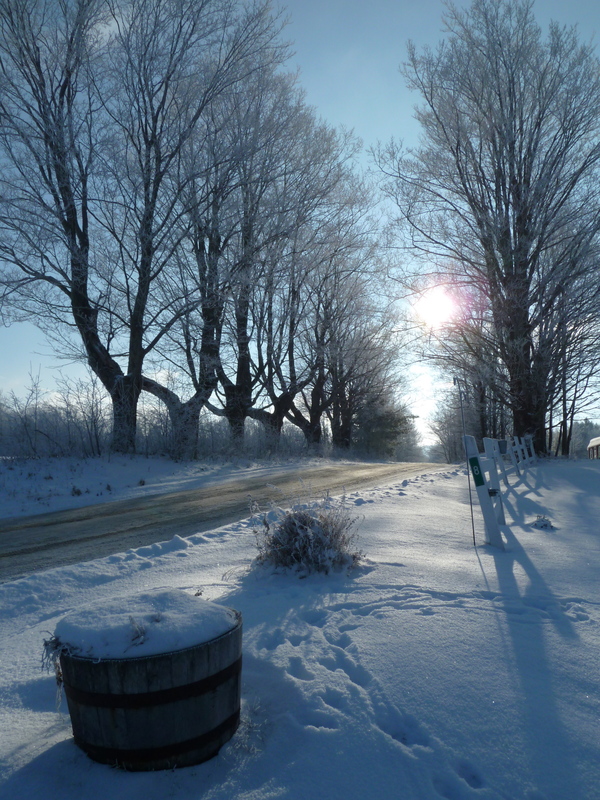 Snow … in the winter… in Vermont. A novel concept. 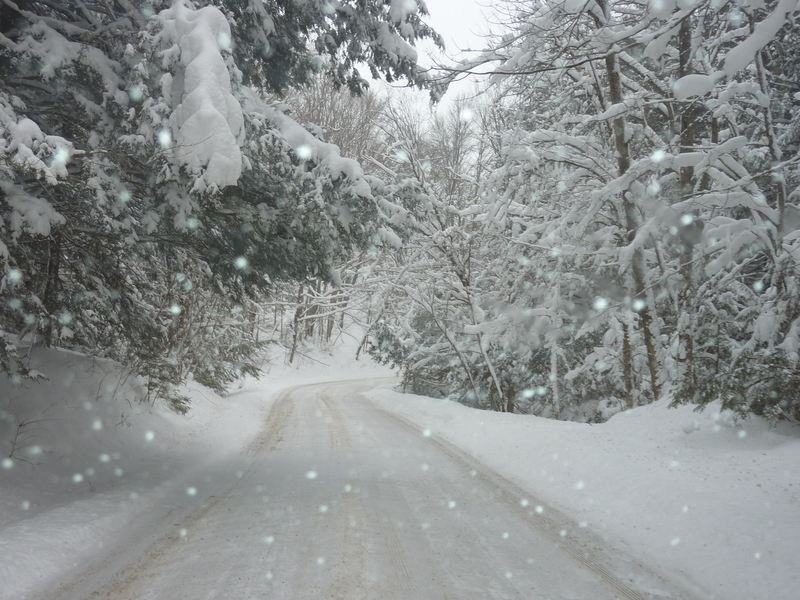 Traditionally a January thaw takes place here in Vermont around the third week in January and usually between the dates of January 23-25th. This is usually noted quite often because it happens right alongside some of the coldest days of the winter. No one knows why it happens and it is commonly referred to as weather lore. Statistically, this time in January records the minimum winter temperatures for the entire winter season. 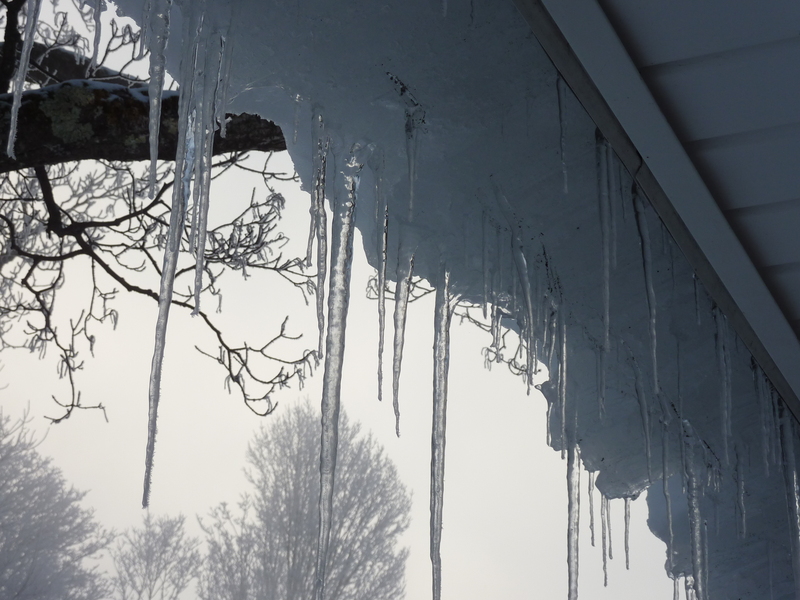 January thaws usually follow an extremely cold snap of weather. No one really knows why it happens when it does, although much research has been done on various theories. Some have attempted to tie the January thaw with various events, such as meteor showers, sun spots, tides, tornados, etc. To date, it appears that no one has come up with any answers. Today, there is snow on the ground and it is in the 20s. By tonight we will have heavy rains and wind through tomorrow night with temperatures close to 50. Crazy. So much for the cross country skiing for a while. I do hope that the snow doesn’t all disappear though, since winter without snow seems pretty pointless … and rather ugly. We had our friends up this weekend with their daughters. Always a blast, we laughed, we relaxed, just had a really nice time. We took a trip with them to VINS which is the Vermont Institute of Natural Science and has some really cool birds that it rescues and rehabilitates and to the Quechee Gorge, it is called the Grand Canyon of the East. While I have not experienced the Grand Canyon of the West, I have seen pictures and this is beautiful but on a much, much smaller scale in a nice quaint New England sort of way. We had a picnic lunch and then proceeded to hike the 1/2 mile to the bottom (really Lou, the sign says .5 mile). We took a small bathroom detour and my friend Kirby, I and some of the kids wound up hiking more 3/4 of the mile just to get to the bathroom and then we had to basically start the 1/2 mile hike all over again. In any event, it was fun, the kids had a blast swimming at the bottom, the gorge is beautiful and it was fun to explore it again. My boys and I took the hike a couple summers ago. It is easy (except for that uphill part) and pretty neat.